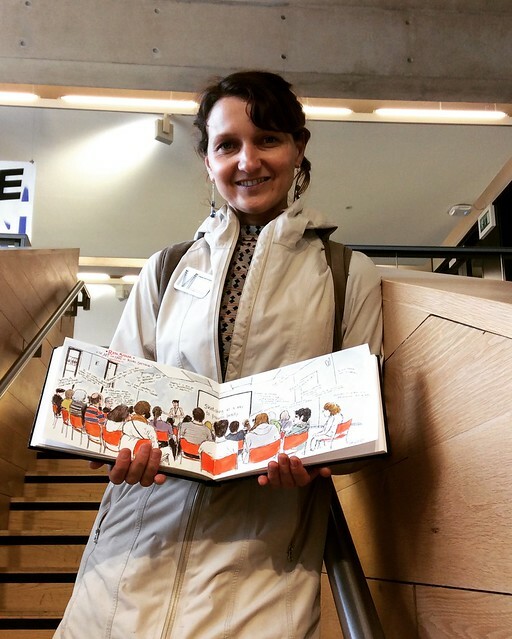 There were many interesting and varied talks that you could attend at #uskmanchester2016. Yes, I just used a hashtag in a sentence. Now if were saying that out loud I wouldn’t say the word “hashtag” but then that is why the written medium is capable of things that the spoken medium just isn’t, and vice-versa, and then there is the drawn medium. One thing I like about sketching at talks and presentations is that you can use it not only to document the visual of the event, but also take notes on the text. There is the issue of course that you must be careful what you write down, as that then potentially defines the speaker’s points in possibly unintended ways – take a sentence out of context, written down in a hurry, and sure they did say that, but it may not be what their talk was about. So whenever I have drawn presenters, I have been aware of this and tried to write down the thoughts and phrases that seem most to encapsulate it, though it’s impossible to catch it all. If sketching people in bars, pick the people who have the fullest glass – they will stay there longest! If people notice you sketching them, smile! You can see more of Rita’s work on her website www.portlandsketcher.com, or on her Flickr page. You can also see three awesome chapters written by Rita in my book, Creative Sketching Workshop! Nice coverage for the symposium. I enjoyed reading your thoughts. Cheers! Taking my time, but I’m only about halfway through. Such a big Symposium! Nice to meet you again there, I enjoyed your videos!